This is my first post here; I'm using CQR LOG 2.3.0 and WSJT-X 1.9.1 on a Linux openSUSE Tumbleweed system with dual monitors, the first (laptop) is 1366X768 and external (LG) is 1920x1080 in resolution. 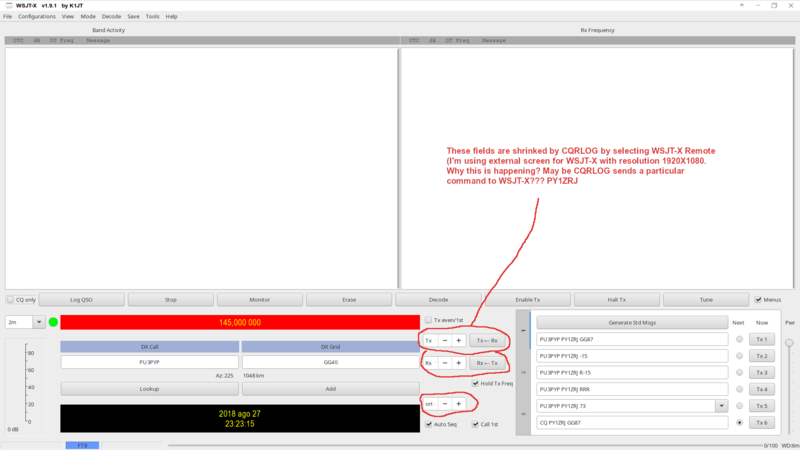 Both applications (WSJTS-X and CQRLOG) are working correctly if started separately, but if I start CQRLOG before and then select New QSO-> WSJT-X remote, then WSJT-X starts with a different window layout so that the fields in WSJT-X window for TX frequency, RX frequency and Report are displayed shrinker, or better the dimensions of these fields are not large enough to display the audio frequency in KHz for TX and RX as well as Report value in the db field. Any suggestion to solve this problem is very much welcomed. I have always recommended to start cqrlog and wsjtx manually. It does not matter if you first start wsjtx remote and then start wsjtx-program or start wsjtx-program first and then start wsjtx remote after that. If you let cqrlog start wsjtx when remote is selected wsjtx will run as child process of cqrlog. If, for some reason, cqrlog stops (crash) it will take down also wsjtx. Usually this happens in the middle of qso ;-( but if you have started wsjtx manually it will keep on running and you can finish qso, start cqrlog again and finally log the qso in usual way. So accept a bit inconvenience and try to start wsjtx manually and look if that helps for display problem. I've just discovered that the issue is present on WSJT-X (shrink-ed fields as I told) when I start it manually, and it occurs exactly the same when I start WSJT-X from CQR LOG clicking on New-QSO wsjt-x remote so evidently this selection calls "wsjtx binary". On the other hand, I cannot start WSJT-X from inside CQRLOG, because there is a stale lock file of previous WSJT-X, so I should try to remove it because I cannot launch another WSJT-X if there is one already running. This is the stale lock I was talking about if I try to start WSJT from CQRLOG. Last comment for today: the start command for WSJT-X from XFCE icon is: "wsjtx --style=fusion". 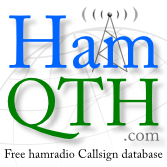 Dunno if it will be possible to add a setting in CQRLOG in order to select a custome setting to start WSJT-X. Now the fields TX, RX and Report are displayed correctly in WSJT-X, without any reduction in their size. Sorry to have raised an issue that could be easily resolved with a bit of care. The differences between X desktops can sometimes make lot of trouble. 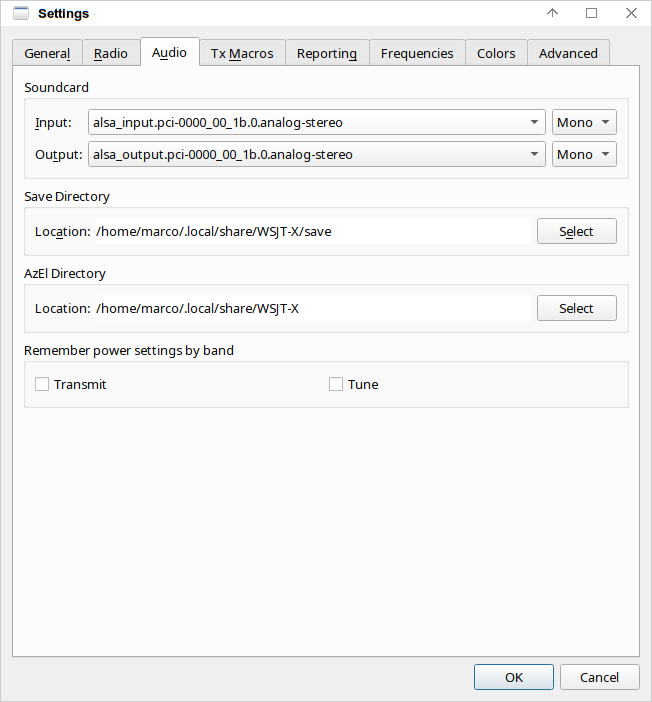 You may find difference selecting wsjtx/settings/audio either "pulse" for both, or "alsa-input....." and "alsa-output..." instead. In my hamshack PC (fedora 27) both works and I use "pulse". But on my other PC (Fedora 28) only "alsa...." works proper way. Using "pulse" it leaves open process when closing wsjtx and thus "stale lock file" on next restart. Although both ways use same sound device there may be difference in different linux versions (I think this is QT version's problem). So it it worth of testing both ways to see is there difference. I neither see "pulse" in my audio settings options. I have set to alsa both output and input as you can spot from the attached image. Note that it seems this is the best configuration for my environment. Anyhow now the stale lock is not anymore an issue because the WSJT-X main window is displayed in the right dimensions. Maybe you do not have pulse audio installed at all (?) It should appear as one choice to those selectors you have now showing "alsa" in your picture. Anyhow using alsa is good choice and ok about that right dimensioning of window effected also to stale lock file.